Not a recipe, just a suggestion. Grill or lightly toast a thick, airy slice of bread, rub it lightly with a cut clove of garlic and season with salt while it’s still hot. Quarter a ball of burrata lengthwise, lay a slice on top and press/smear it over the crostini with the back of your spoon. Finish with some fresh, finely sliced or baby basil leaves, a drizzle of your best extra virgin olive oil, a sprinkle of Maldon salt and the tiniest bit of freshly cracked black pepper. When I want to dress it up just a little more, pesto is my go-to, a really nutty one like pumpkin seed pesto that provides a bit of texture, and some chili oil. 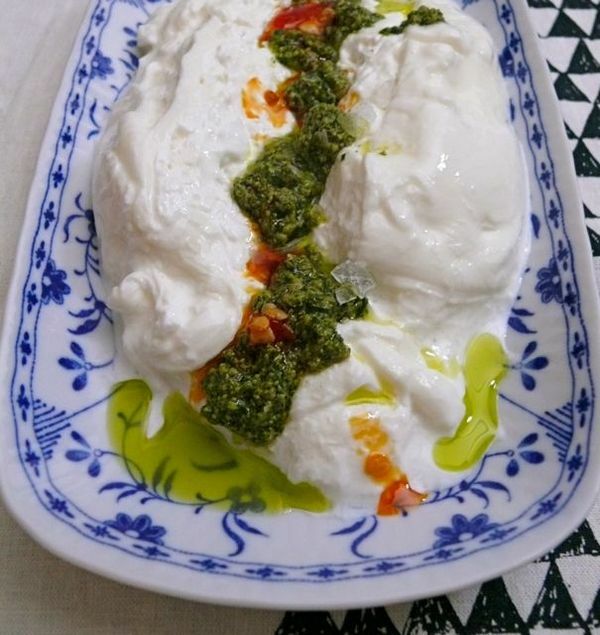 One standard-size piece of burrata should serve 4 people who want a taste–6 even if you’re serving this with bread, as suggested. It could also serve 3 greedy people. Or 2, very unwise people, who will not feel so great half an hour after eating too much of a too-rich thing. Trust me.